The Clow-Beck House is located at Clow Beck House in Darlington. Check room availability using the search box on your right. A warm genuine welcome awaits you at the Clow-Beck, 14 luxuriously themed rooms and all that little bit extra special. 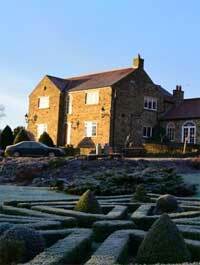 The guest house offers superb food, extensive wine list and award winning gardens. Darlington town centre is just ten-minutes drive away and the motor racing attraction, Croft Circuit is also nearby. All 13 bedrooms come equipped with en suite bathroom featuring power shower, pocket-sprung beds and feather pillows. The food is also top-notch, with everything from locally hung steaks to homemade pate, are all cooked to order. Disabled facilities, Childrens play area and safe car parking are also provided. Winners of the White Rose Award for Guest Accomodation.